Thanksgiving officially kicked off the “Holiday Season,” which can only mean one thing… holiday parties are on your horizon. Holiday gatherings naturally engender lofty feelings of elegance and style. One conjures images of velvet jackets by the fireside and maybe a glass of port in hand, but one false step and it’s easy to make a mess of your festive ensemble. Holiday party attire calls for festive looks, but “festive” and “stylish” are not necessarily mutually exclusive. Take our advice and you’ll be prepared to navigate any and all of your events with effortless poise. The most essential component of holiday party attire is understanding what type of event you’re attending, and what dress code will be required. For the most part, holiday parties can be grouped into four main categories: black tie and formal affairs, company holiday parties, social soirées, and casual gatherings with family and friends. Whichever category your party falls under, we’ve got your back. For black tie celebrations, stick to the classics. This means a black or midnight mohair tuxedo paired with a white turn-down collar tuxedo shirt. However, if you want to take advantage of seasonal fabrics, look no further than velvet. Its voluptuous sheen and handle immediately evokes attention to detail and class. 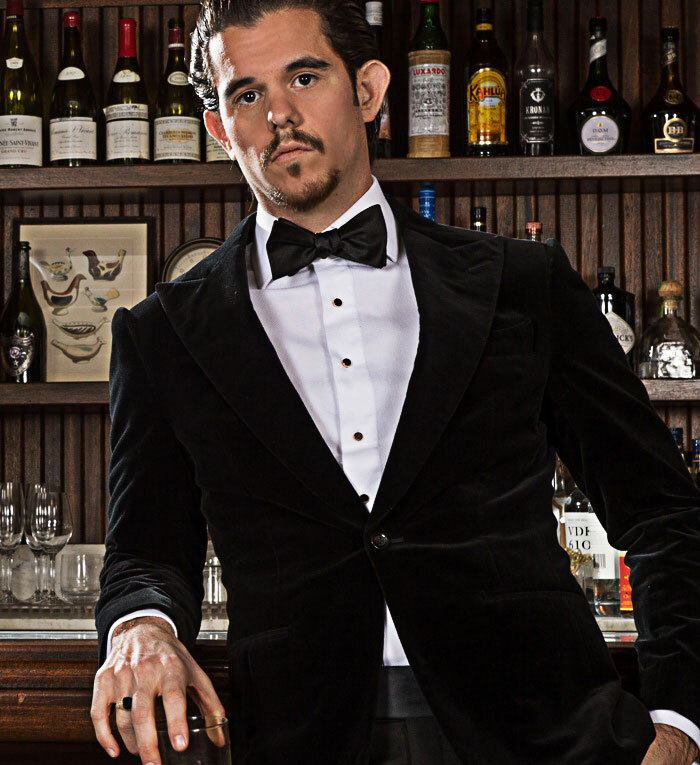 Don a black velvet sport coat instead of the traditional tuxedo jacket and you will not only achieve the same level of decorum as everyone else … but it will completely set you apart. When it comes to company holiday parties, it is most likely a time to dress up a bit more than your typical work day. With most workplaces being business causal, this could be your moment to reveal how truly stylish you are. 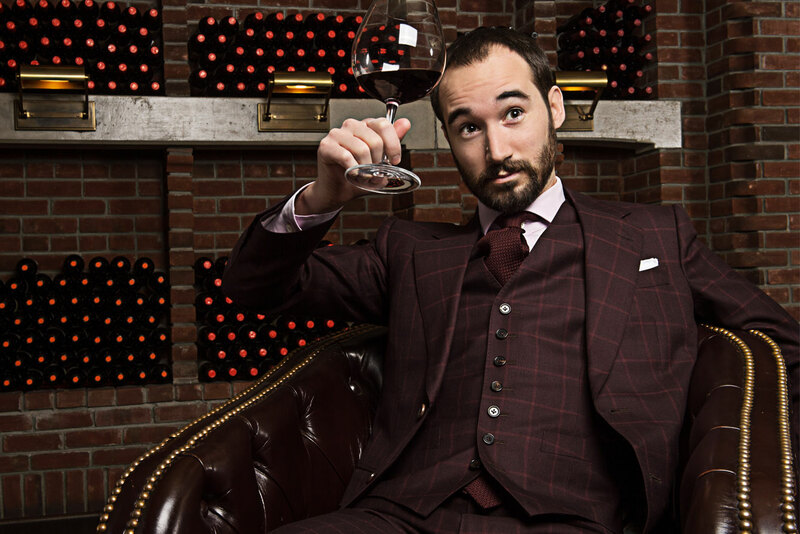 Look no further than a dark, perfectly cut suit worn with a tie… no open collars, you’re not Tom Ford. And since Christmas is in the air, we say go burgundy. This festive but restrained approach is the perfect match for the occasion and a welcomed relief from the garish cherry-red colors we have become so accustomed to seeing during the holidays. 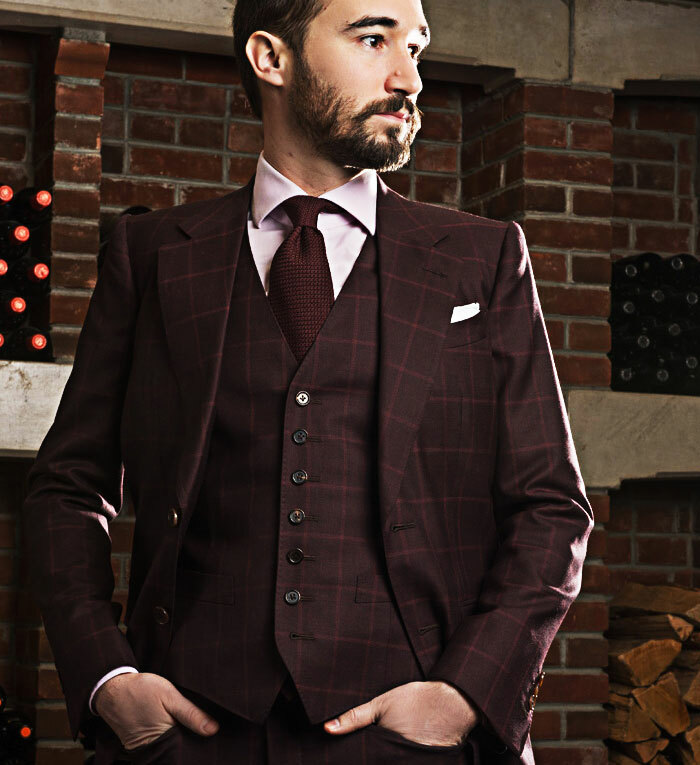 Our subtle burgundy check suit is paired with a white spread collar shirt and beautifully rich maroon grenadine necktie. Social holiday parties, are on the whole, less formal than company parties, but you should always be on your game. Don’t let any occasion, no matter how informal, convince you not to bring your best self. 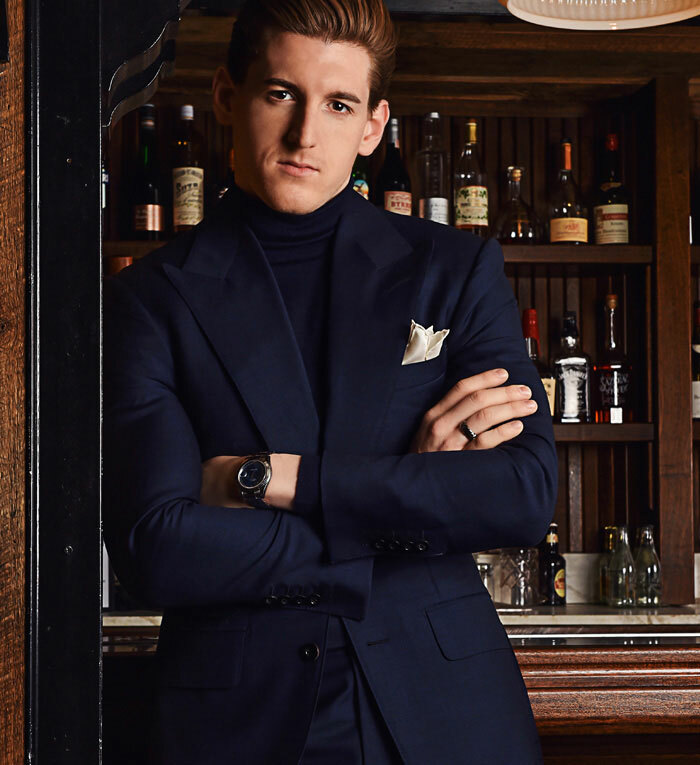 One of the best outfits you can possibly employ during the colder months is the dressed down suit paired with a roll-neck sweater. In this instance, we suggest going monochrome and utilizing tonality throughout the entire outfit. 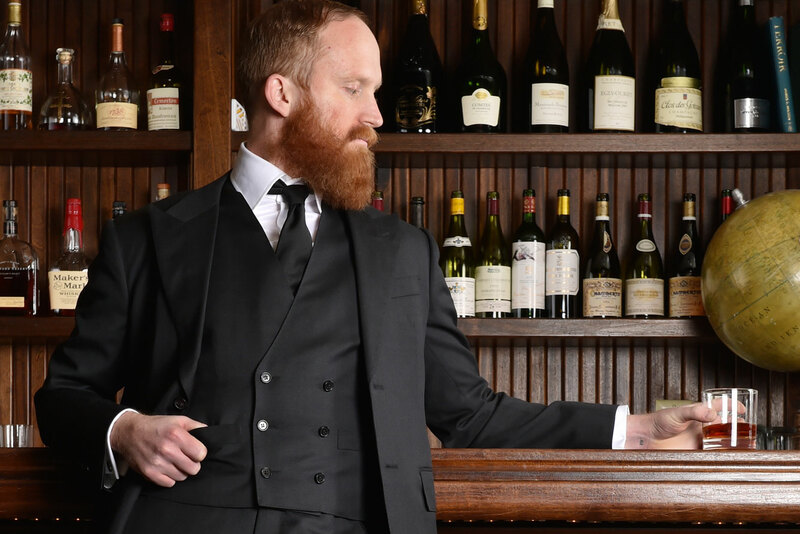 Done right, this look will actually have you looking like the rakish gentleman you envisioned from your favorite espionage film. When the dress code requires a much more casual approach, we always suggest erring on the side of being too dressed up than the contrary. You will never go wrong with expertly paired separates. Reach for a complementary palette of earth-tones and amp up the texture. 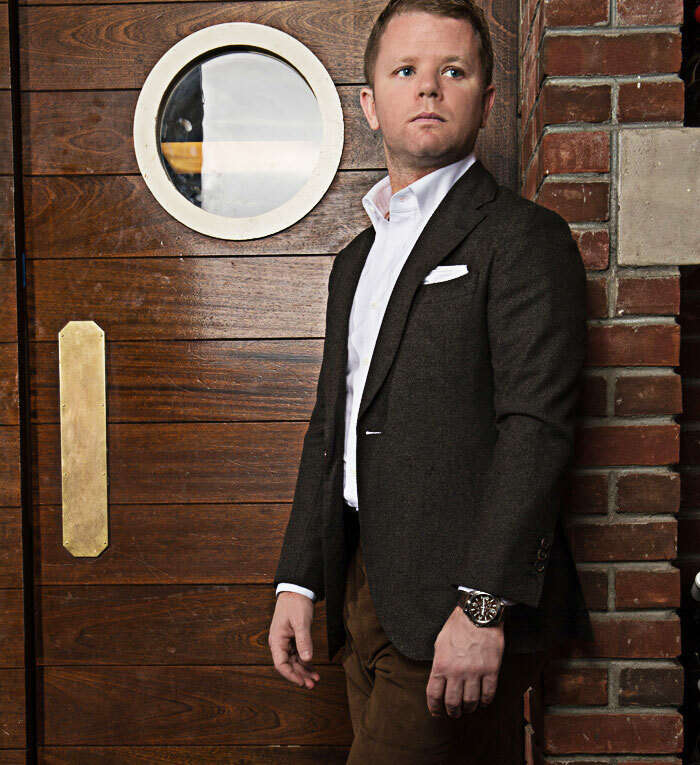 Take this dark, almost black-green bouclé sport coat along with rich chocolate moleskin trousers. Now you have permission to tie it all together with the always elegant open collar white-cotton dress shirt. It’s an outfit that says you care about what you look like, but you’re not trying too hard. There you have it. Now it’s up to you to go crush the holiday party scene. And if you don’t have what you need, we’ll create it with you. Cheers… go get em’.